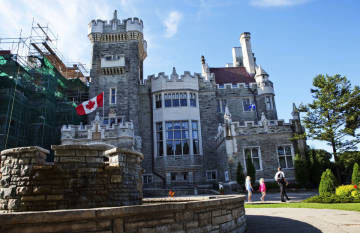 The Kiwanis Club is refusing to fire the chair of Casa Loma’s board, a move that could lead the city to evict the service organization from the castle. Council set a deadline of July 31 for the Kiwanis Club – which has operated the interior of the city-owned attraction since 1937 – to replace Richard Wozenilek, a lawyer who allegedly directed $218,938 in castle legal work to himself over 18 months. But the deadline has passed and Kiwanis has decided to back Mr. Wozenilek. “The Kiwanis Club continues to maintain its full support behind Mr. Wozenilek as chair of the Casa Loma Board, and it understands the members of the Board also fully support him,” Joachim Gerschkow, the president of the Kiwanis Club of Casa Loma, said in a statement Tuesday. The city could move to evict the Kiwanis Club from Casa Loma if the club doesn’t remove by July 31 a board chair who allegedly directed $218,938 in legal work to himself over 18 months.Council set the deadline while voting to give the service organization, which has operated Casa Loma since 1937, another chance to meet the terms of a management deal inked with the city in 2008. Casa Loma is the perfect setting for palace intrigue, and that’s exactly what’s unfolded beneath its Norman and Scottish towers in the last two years. Now the intrigue is moving from castle to council. Toronto’s elected officials will decide this week whether the Kiwanis Club, the charitable organization that has managed city-owned Casa Loma since 1937, deserves a third chance to drag the tourist trap into the 21st century or whether the city should begin severing a partnership that’s been a royal pain for both sides. Jun-3-2006 Globe and Mail – Our Casa or their Casa? Warning: Never come between a Kiwanian and his castle. Even if you tippy-toe, as the city is attempting to do with its “implementation of a new vision and governance structure for Casa Loma,” you are going to get whacked. The report from an advisory committee recommending a gentle end to the service club’s 69 years of operating the great pile on the hill is “ludicrous,” “ill-prepared” and “ill-conceived,” according to lawyer Richard Wozenilek, head of the Kiwanis Club of Casa Loma. The club “vehemently rejects” the report’s “egregious distortions,” a press release states. The only exceptions are the parts it obtained from the club’s own report on its own vision for the city’s No. 3 tourist trap, according to Mr. Wozenilek. “We really got upset with this,” he added. Posted in 2006 News, Archives, NEWS	| Tagged 2006, Globe and Mail	| Comments Off on Jun-3-2006 Globe and Mail – Our Casa or their Casa?